Some of the most amazing things I have seen in my entire life are things I have seen looking out the window of an airplane. I was 16 on my first flight, alone and on my way to Belgium as a high school foreign exchange student. I spent the whole flight glued to the window, seeing the world from above for the first time and quickly letting it change my entire perspective of the planet. I flew over the US and saw the vast Agricultural grid that makes up the bulk of the center of the country. I saw constellations at eye level and the sun rise from below. I entered a whole new country from above and remember how different it looked from back home. That first trip changed my life, but was only the beginning of what I have seen from above. Since then I have seen the northern lights dance out my window over Greenland, I have seen glaciers and icebergs the size of which I could only guess. I have seen bush fires in the night raging across Africa and the sun set over the Sahara Desert. And then today on my way to Korea, as we flew over Alaska, I saw Mt McKinley, the largest mountain in North America and the tallest mountain from base to summit in the world. It was breathtaking and just another incredible reminder of how beautiful this world is. I was awestruck by another incredible sight from above. 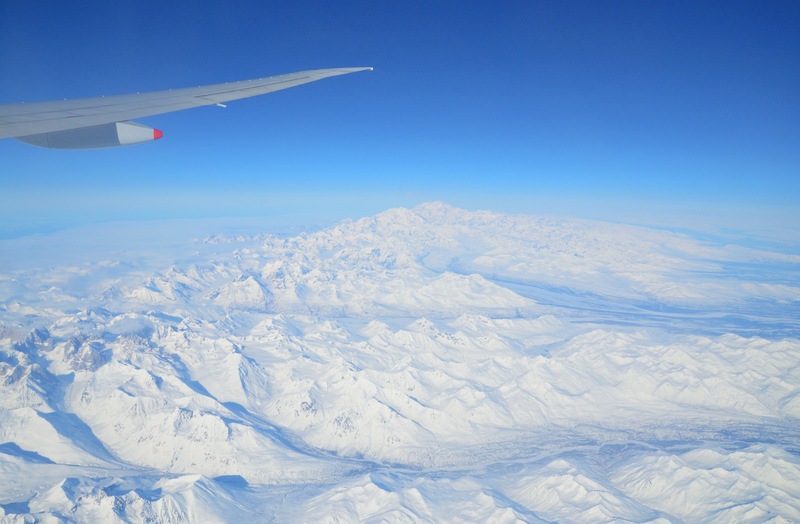 But, then the best part came not long after that imposing mountain had fallen from view, when after crossing just a few miles of frozen ocean we made our way into flight over Russia. And to be honest, in that moment, even the smallest notion that flying across the globe to far away lands was environmentally or socially irresponsible was gone. I was over a part of the world I had never been over before and a part of the world I desperately wanted to visit. My imagination was being sparked in a way it hadn’t been in years. I was being reminded, as I looked below at a country that had captured my interest since I was a child, that it can be easy to forget that the whole world is out there when you are just living your day to day life, but while flying over the world you just can’t ignore the beauty and vastness that is this planet. This entry was posted in Photography, Travel and tagged Korea, photography, travel on April 3, 2012 by Lauriel~Arwen. What wonderful observations. Thank you so much for sharing your words and photos.